HMHS Britannic, Olympic and Titanic‘s sister ship and youngest in a trio, was built at Harland and Wolff located in Belfast. After the Titanic disaster Britannic underwent a number of changes. In addition to an adequate amount of lifeboats, her watertight bulkhead were extended higher than Titanic‘s had been. On February 26, 1914 she was launched and would begin her fitting out. But unlike her sisters she would never be destined to wear the garb of the White Star Line. No…For the rest of her short life she would operate as hospital ship, ferrying war casualties of the Great War, back to England. Britannic, on her maiden voyage, left Liverpool on December 23, 1915. Destination: Mudros. She arrived there 8 days later. 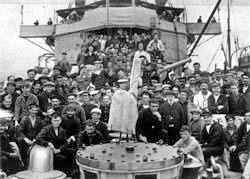 Aboard the ship was Violet Jessop, a Titanic stewardess who had also been aboard the Olympic when she collided with the HMS Hawke. Jessop was now serving as a nurse. It was the sixth trip. 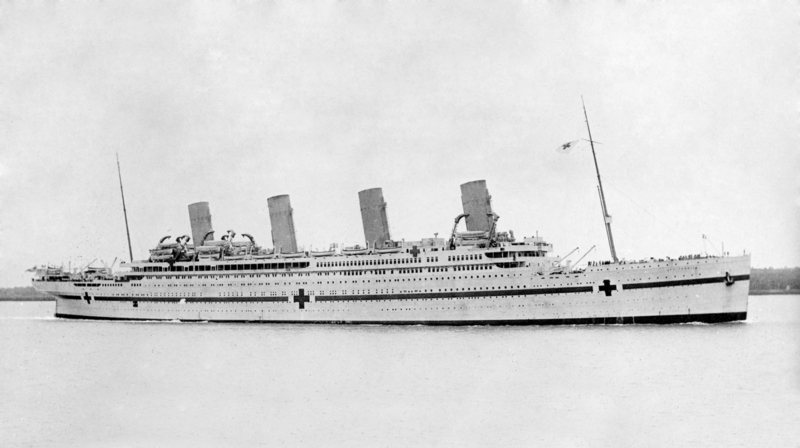 Britannic had left Southampton November 12, 1916 under the command of Captain Charles Alfred Bartlett. Now nine days later an explosion rattled the ship. The ship shook violently. To this day no one can agree on what caused it, whether it was a mine or a torpedo. The distress call was sent out and the HMS Scourge was soon on her way.The HMS Heroic had also altered her course to aid Britannic. On board people who were eating breakfast when it suddenly quieted. Others some place else grabbed their lifebelts. When it became apparent that something was terribly wrong they began heading up on deck to board lifeboats. When lifeboats began leaving Jessop grabbed her toothbrush before boarding a boat. Why, you may ask, did she take a toothbrush of all things? She remembered how much she had missed it after Titanic. On the bridge Bartlett tried to beach the ship on the nearby island of Kea. This only caused more flooding. Also aiding in the flooding was the fact that portholes had been left open and water began to spill in. A terrible tragedy struck that compounded the situation. Two lifeboats were sucked into moving, massive propellers which had now surfaced. It killed and wounded the boats’ occupants who were unable to get away. Jessop was aboard one of these boats. Fortunately, she was saved. Bartlett ordered the engines stopped, saving a third boat from becoming like its two predecessors. The call to abandon ship was finally given. Britannic took her final plunge at 9:07 AM. It had taken 55 minutes for another of White Star’s massive ships to die. At approximately 10 AM the Heroic arrived on the scene of the disaster. She lowered her boats and took on a total of 493 survivors. The Scourge also arrived to take on 339 survivors. These two vessels were not the first to arrive though. Instead that honor went to a Greek fisherman who managed to pick up survivors. Scourge soon left for Piraeus, leaving another ship, the Foxhound, to take on 193 survivors that Scourge had no room for. Some survivors from the Heroic and Scourge were transferred to the HMS Duncan. The ratio of survivors to those lost was 1032:30. Britannic was left to rest in the Aegean Sea, another lost sister.